Stamping with friends is SO much fun! Last night my buddy Lis came down and ate some yummy cake with me to celebrate my birthday Ü I've been telling myself this past week that with each year that passes I must be getting a little more "learned" - can't think of it as getting older - right?!? So instead of celebrating with a birthday card I thought I'd go back to the very beginning of days when babies are simply "adorable" and celebrate those days instead. One of the huge benefits of stamping with my friend Lis is that she stamps differently than I do. 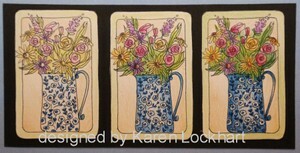 She will create key elements for her cards, using the oh so clever techniques she has learned over the years. Some of the techniques she has shared with me are from the courses she has taken, others are just things that are trial and error. So I just started to "trial and error" with her Ü. 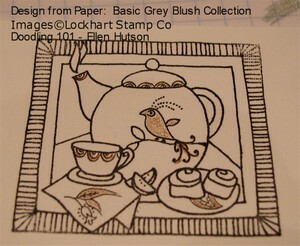 Using many of the fabulous stamping products that are tucked away in my cabinets brings glee to my heart. I am quite tickled with the finished trials of today. At first I questioned them, but I create with an end picture in my mind. I created my elements wondering if they would be good enough and WOW - they all came together when the finishing touches were added. I began with the letter "a". Lis was playing with her grungeboard and I was loving her results, but instead of grungeboard I had Cosmo Cricket chipboard Alphabuttons. We discussed the merits of these different materials. Lis had also created a piece using a chipboard button and it really intrigued me. So I started off on my little journey emulating and learning from what Lis had done. I painted the chipboard with a handy white Paint Dabber allowing it to dry. 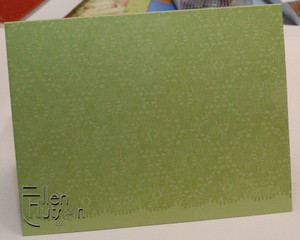 Then the Large Polka Dot backgrounder was stamped over the white background and embossed with clear embossing powder. After heat setting the powder I then rubbed a Lettuce Paint Dabber over the letter. This is when the trial and error part started for me - LOL! Timing is obviously of the essence with this technique. You are supposed to let it dry a little and then rub off the excess paint with a damp tissue or wipe. Well this little exercise happened a couple of times before I felt like the color and look of the letter was "good enough". I couldn't leave well enough alone and so at this point I inked up the Paisley backgrounder with Silver Encore and stamped my letter, quickly realizing - oops I shouldn't have done that if I wanted to keep the polka dots exposed. I grabbed my heat gun and began heating it to see what effect this would have. Not liking where it was headed I grabbed a paper towel and quickly wiped the entire letter. This is when accidents can turn into beautiful discoveries. You can not see it in this picture, but the letter has an almost irridescent quality to it and woohoo - the polka dots were still in place. Yep, a happy mistake. I then took my blending tool and added several different Distress Ink greens to the edges of the letter. I love the soft feel that this spongey tool gives to my projects. This was followed by edging the letters with a Silver Leafing Krylon pen. Yeah - I had one fabulous element for my card and a fun adventure and new discovery that I wonder if I'll ever be able to emulate again - LOL! The next component was the brown piece of cardstock. It is also difficult to see the beauty of this piece, but here is a closeup to try and give you a better idea of what it looks like. 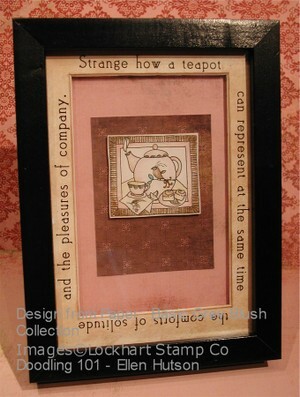 This piece was created by taking Vanilla Bean CS and stamping the Paisley backgrounder using a Perfect Medium ink pad. 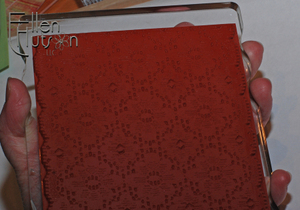 I could have used an embossing ink pad or Versa Mark pad, but this is the one that was convenient - LOL! Once again I used clear embossing powder and then heat set it. I followed this application by sponging over the top of it in a circular motion using Distress Peeled Paint and my blending tool. 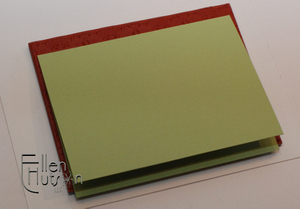 This helped bring my brown cardstock closer to the brown/greens that were in the decorative paper I had selected from the new Memory Box Sprout collection. Last but certainly not least was the little Sweet Pea that would be the focal point of the card. I stamped it on Arturo using Palette Burnt Umber (this is a waterproof ink) and watercolored the image using a waterbrush and Lyra watercolor crayons. A scalloped classic circle, a little more sponging, some piercing, brushed silver brads and some pink gingham ribbon and wheeew - I was finished. Woohoo - I made it all the way through - did you? LOL! I think it took longer for me to describe this process then it took for me to actually make the card Ü So my final thought for today is don't be afraid to experiment - sometimes you discover fabulous things by doing so! As we go about making cards we sometimes get stuck in a rut. Being that many come to me for guidance in coloring most of my creations incorporate coloring to some degree, but I also enjoy stamping without doing any coloring at all. When I need a really quick card I go back to some very basic stamping techniques. 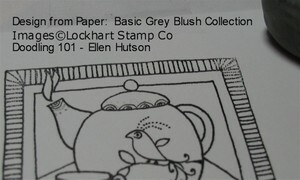 The Lockhart Stamp Company images are ideal for coloring in, BUT they are also adorable just simply stamped on colored cardstock or patterned paper. I thought about stamping each bug in black on the circles I had cut out using the smallest Nestability circle die. The more I thought about it the more I realized I wanted them to just be a subtle part of the card and not jump off of the paper as a black image would. The final destination I wanted your eye to settle on is the floral piece. Monochromatic stamping is subtle - select an ink color that is slightly darker than the color of cardstock you have selected and stamp your image in this tone on tone format. It was quite easy to eyeball and stamp each bug in the coordinating ink color, but if you are afraid of missing and having to start over you can always pull out your Stamp-a-ma-jig. It is a tool I use often, but found unnecessary in creating this card. I then placed the circles back in the Nestability die and embossed the images. I find it easiest to cut, stamp, and then emboss. I am loving my new CHF backgrounders! They are allowing me the freedom to be a "Stampy Stamper". This is a phrase that Mona Lisa coined and it describes me to a "T" - I love stamping and to have the freedom to create distinctive papers that coordinate has given me much pleasure Ü The scale of the Large Polka Dot backgrounder was perfect for this card. One other design element that I thought about as I created this card was the repetitiion of the circles - it's a LOT of circles I used, but it was this repetition that I felt would bring a strong statement to this card! If I could nudge my focal line of circles over to the right about 1/8"-1/4" then my layout would make me much happier - yes, it's the perfectionist in me. I should have laid my circles down before applying adhesive - LOL! To finish this card off I felt that the sentiment "It's the little things in life that matter most" would be perfect with all these little bugs. Try creating one of these tone on tone, circle cards and link me up girls - I'm still waiting to see what you are all creating! I got quite the chuckle when I saw Debbie's post - her creation is OVER THE TOP beautiful. So why chuckle you ask - well I chuckle because she used the Bride and Groom. Over the weekend I had started the creating of the card for this post - guess which images I used? Yep, you've got it - the Bride and Groom - LOL! And yes, I was begging Karen Lockhart for this groom, so please buy it - LOL! I absolutely am thrilled with how well this couple fits together - they truly do compliment one another. It's the season for wedding preparations. With all the summertime weddings coming up it is now, that many brides (and grooms) are working eagerly towards getting ready for their big day. 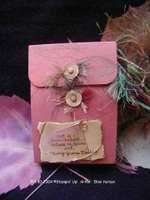 So why not start thinking of how you will surprise them with something hand-made on their wedding day. Weddings typically have a soft edge to them and so in thinking through this creation I felt that I wanted to use simple Pergamano techniques to create an ethereal feeling to the image. 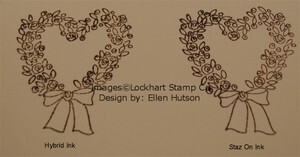 I began by stamping the groom using Palette New Canvas ink on the Parchment Paper. To get my placement exact on the bride I did the exact same thing as Debbie - I pulled out my Stamp-a-ma-jig. It is a tool I just can't live without being I always like to stamp with precision. To bring out the softness of the white stamped image I used a combination of two different embossing stylus - both the fine stylus and extra small ball. 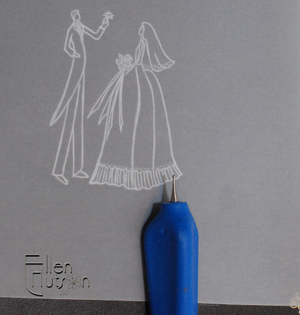 Once the image is dry I flip it over on to the specially designed embossing pad and draw over the stamped outline using these fine-tipped stylus. Once completed I then colored the image on this side with Copic markers. 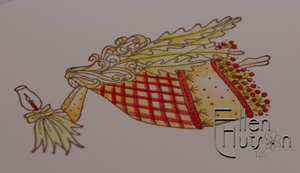 Copics work SO well on Parchment paper - they truly allow you to get a watercolor like feel to your images. 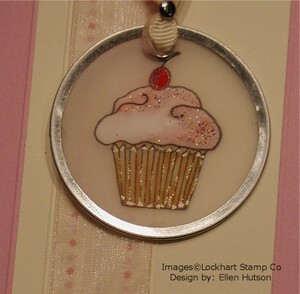 When teaching stamping classes as a Stampin' Up! demonstrator there were two ink pads I always recommended to a beginning stamper - one was black and the other was VersaMark. The subtle watermark or color tone change that occurs on most cardstocks when you stamp an image using this particular ink pad is subtle, yet distinct. I would like to take this opportunity to let you know that Memory Box Cardstock is made completely different then cardstock that is colored all the way through and therefore VersaMark does NOT leave a watermark on Memory Box Notecards or Cardstock. 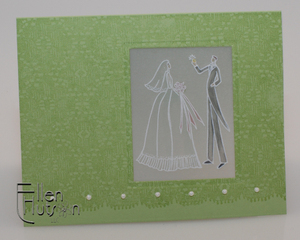 So for this creation I used Certainly Celery cardstock from Stampin' Up! 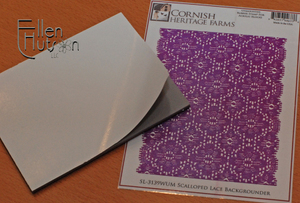 As you can see from the finished creation inking the Scalloped Lace Backgrounder with VersaMark and stamping on cardstock leaves a beautiful, monochromatic impression. This beautiful addition allowed me to create a simple card with a lot of WOW factor. The window was cut and embossed using a rectangular Nestability, and white pearls were affixed to help complete that "wedding-like" feeling. 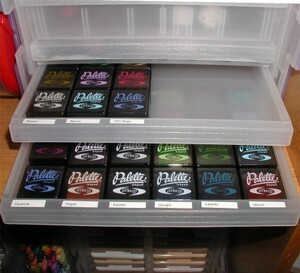 Now for my storage tip Ü I have taken a few pictures to share how it is that I am storing my backgrounders. First I run the paper insert that comes with the backgrounder through my Xyron machine - laminating both sides of the insert. I then remove the backing on the backgrounder and attach it to the back of this insert as shown below. When I ink my stamp I just leave my backgrounder on this laminate covered piece and lay it face down on my work surface, tapping the ink pad evenly over the entire backgrounder. 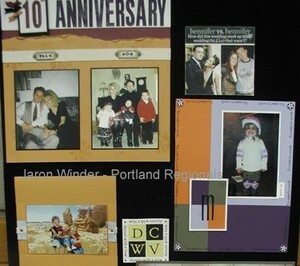 Place your cardstock on your background in the desire location as shown below. 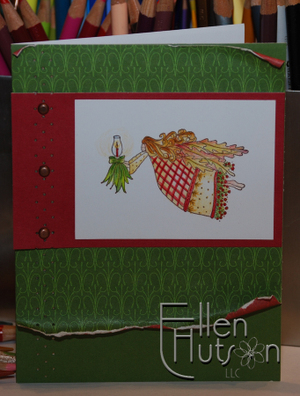 I then flip the scrap paper that I am working on over the top of this "sandwich", lightly holding the card in place. Next I gently rub my hand over the entire surface. Lift and remove. Look how beautiful and crisp the image is Ü Thank you to Julie Ebersole for the wonderful tip of using the scrap paper I am working with - no longer do I go running around looking for a scrap piece of typing paper when I am getting ready to use my backgrounds - LOL! Being that I know others like to feel the stamp in their hand we do have an alternative for those who prefer this method. 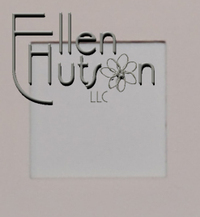 We have found a beautiful acrylic block that is just the right size for use with backgrounders and other large stamps. Having the ruler grid allows me to easily line the stamp up perfectly. As well the finger grip positions make it more comfortable to use. I have a rather small hand - 8" from tip of my thumb to the tip of my pinky when my hand is fully stretched open. I can still control these blocks due to the finger grips that are in place. Another method for those who already own wood mounted backgrounds that have a decal in place on the front is to remove the backing on the Smart Cushion or EZmount stamps and temporarily affix it to the face of a wood mounted background. 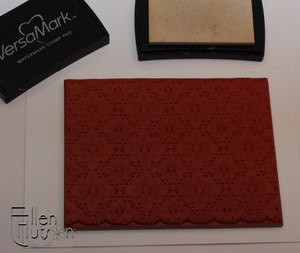 Once you have finished stamping clean the stamp, remove it and place it back on to your storage surface. One last little bit of information that I would like to share in regards to storing Smart Cushion or EZ mount is extremely important. 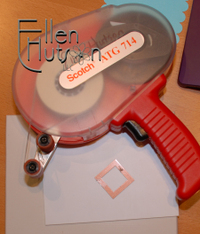 Please Note: It is not recommended that you store any of your Smart Cushion/EZMount Stamps on Acetate Sheets. Acetate is made with chemicals that will react with the Smart Cushion/EZMount and any other cling cushion type product, making an almost permanent bond between it and the cling. Acetate products include transparencies and many binder inserts. Laminate sheeting is not supposed to have the same effects and therefore the reason I am really excited about being able to use my Xyron for this purpose. It's the talk of the town, or perhaps better said - the internet. 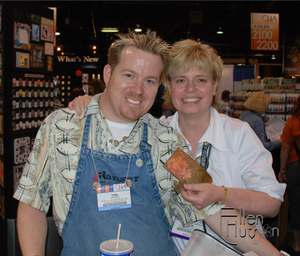 Tim Holtz has a blog and he has WOW'ed us all with his amazing tags!!! Tim has always inspired me with his over the top creativity, so last night I finally had an opportunity to play with the myriad of toys that I have had sitting on my shelves since (embarrassed a little here) last MAY!!! At CHA this summer I was a lucky girl - at the very end of the show, when most everyone had already gone, Tim was just finishing up his work at the Ranger booth. My good friend Mona Lisa introduced me to Tim and I had the opportunity to "quiz" him regarding the Ranger line of products and he demonstrated several of the techniques that he is well known for. We had a wonderful conversation and he made an incredible tag which I have in my collection of things I'll keep for a LONG time - LOL! This little beauty shimmers and shines just like Tim's smile. I couldn't believe how nice he was after being "tormented" by all of us ladies, for all those days - LOL! So in honor of Tim's tag challenges I decided to try and create one with an Ellen twist using the Lockhart Wreathe Angel. As you all know I love to airbrush and have had this idea in my brain for a LONG time - I wanted to try the Heidi Swapp Masks with the airbrush. Well the results are great - they can be repositioned and reused - a feature I do love. My only caution is that they are REALLY sticky. My first try out I stuck it to my tag and when I pulled it off along came the paper, sticking to the back of the mask. Well needless to say I decided to try something different with the next one and took my fingers and just patted all over the sticky backs to lessen the adhesive so that I could then remove it without pulling the paper off. I also did not press them down to my paper, but just laid them in place. They quickly adhere and that's when I sprayed. The tag is a small manila one. I didn't have any of those lovely gimungo ones that Tim has. Can you believe that one? I guess it's time for another shopping trip Ü I positioned a couple of the leaves on the manila tag and then airbrushed using COPIC Sketch Marker Y63. I then spritzed with my special "Tim Concoction". I will share that below at the end of my post. After removing the masks I then very lightly airbrushed the entire tag once again just to add a hint of green to the leaf sections. I colored the angel with Prismacolor pencils and Copics after adding the embossed details to her dress. Copic Spica Glitter pen highlights were added to the ribbons and her hair. I used a Copic marker to change the color of the tag "circle". Next I added dimension to the background paper by once again placing my masks on the Crimson paper. My secret to spraying in my craft area is this big box. I can tell you that my first spritz was not a pretty thing - LOL! I actually was holding my mini mister sideways and - a big OOPS! Needless to say I learned my lesson and now use a box instead. So following is a simple "Tim Concoction". I use a clear mini mister so that I can see what is in each little spritzer. To this I add some color wash and Perfect Pearls. For this particular project I mixed Red Pepper Color Wash with Perfect Gold Perfect Pearls. Tim demonstrates on his blog how he has used a popsicle stick to add the Perfect Pearls to the bottle. I have a teeny, tiny spoon that I like to use. A little goes a long way. The result is oh SO Christmasy! I'm going to share a little secret with you regarding this month's Stamp of the Month project - I sprayed my flowers and background paper with this mixture too Ü The shimmer that these projects have just can't be captured with my elementary photography techniques. A little piercing, some gold glass beads, a hammered brad (yet another cool Tim Technique and Tool), some Tarnished Gold Embossing Powder and my Tim inspired project is complete. I hope that you have a relaxing weekend even though the holiday season is in full-swing. Take some time out to breath and create if possible and enjoy some wonderful Christmas music as you create. I have Sarah McLachlan's Wintersong playing in the background. Her voice is magical and just makes me feel warm inside. ETA: I just wanted to take this opportunity to remind you all that once again Nichole is going to blow your socks off with her latest stamp sets - they unveil tonight. I would also like to thank Nichole for being such an absolute delight to work with!!! It is with sadness and yet a sigh of relief that I share with you that I will no longer be a part of PaperTrey's design team. As you all know my life has been VERY full this past year and it is becoming increasingly busier with each passing day. It is so important to try and maintain some sort of sanity and reduce the deadline stress load. It is so wonderful to have relationships with other women who do what I do and I look forwards to supporting Nichole and what it is that she does in the years ahead. Her talents never cease to amaze me. Thank you Nichole! OK - I'll admit it - I am totally diggin' this airbrushing stuff. I'm not certain why that is, but all I can say is that it is completely and totally addictive. I am having such a ball just learning how to finesse this tool. Nothing much to show for my work yet at this point, but I am learning and it has been SO much fun! Tonight's post is more of an educational post. I have had many of you ask me about the ease of use, what color value range works the best, etc. and so I am hoping to help answer some of those questions with this post and future ones. I am going to share some pictures of how easily this system goes together. It comes with complete instructions and I HIGHLY recommend reading these before beginning to do anything with your new toy. There are precautions listed and advice that will really improve the quality of your work. Following are the basics. Unfortunately I forgot to take a picture before I attached the air adaptor (the can in the picture above) to the air grip (the little trigger mechanism). It easily screws together - sorry I missed this piece, but I didn't want to waste any of my precious air by pulling it apart again - LOL! 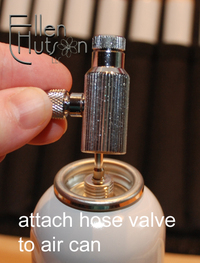 At the other end of the hose is a valve that houses the air regulator. 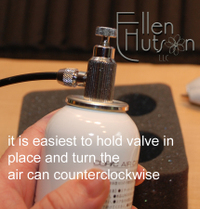 The regulator does just what you think it will - it regulates the amount of air that is released from the can. The little screw at the top of the system is how you release the air. I find it easier to attach this valve by holding it firmly in my left hand and turning my air can on to the valve/regulator by rotating it counterclockwise. 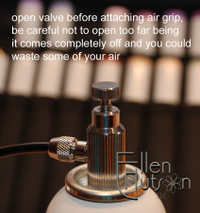 Be certain that your valve is opened as shown above before attaching, otherwise you will hear a "psst" as the air starts going out and it might startle you. If your hose is attached at the air adaptor/air grip it will stop you from loosing air, but I still recommend that the screw is in the position shown above. You will also want to be certain that you don't open that screw too far because guess what it comes COMPLETELY OFF. At that point the air just goes escaping in to the air. Guess how I found that out?!? LOL. So play with all the parts before you start putting your gadget together to familiarize yourself with all the little twisty parts before attaching it to your air can. 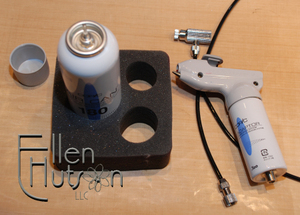 As soon as you have your pieces attached it is best to place the air can in to the foam grip stand that is provided in the kit. Please note that you must NOT shake the air can or lay the air can on it's side while operating. The liquid within the can becomes so cold that it can cause frostbite. Now that's cold! 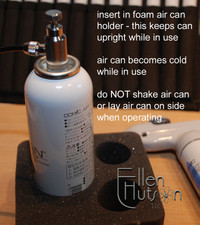 Somehow this liquid can escape if the air can is on it's side, so be certain to place it in the foam grip whenever you are using your air brush. Fortunately I can tell you that I have not experienced this little dilemna (yet) - which actually surprises me being that I am apparently accident prone - LOL! OOPS - I forgot to add - the markers came in and went right out to their respective homes. Guess what - I am now completely sold out of some of the sets yet again. More are on order, many more - but patience is a virtue and I refuse to put them back up as a preorder item until I know what the correct ship dates are going to be. I am so sorry we continue to sell out of them at lightning speed, but please know that I am doing my best to get an inventory in stock that will not keep you waiting. So once again I am doing my utmost to be patient. Thank you all again for your continued support and I hope that I receive some magical news from my COPIC representative when I call tomorrow. I'll be updating on all items again once I receive updates. THANK YOU! In creating this month's Stamp of the Month Packet I once again wanted to bring you a project that you could utilize for your upcoming Christmas cards, as well as use the Angel in other ways. Therefore I picked the Harvest angel and paired it up with colors that would say Christmas instead of Autumn. I know that in the past you have found the color progressions to come in handy and so once again I snapped photos as I colored in the image. I will admit that these are not the best photos. It's funny how the awkward angle makes a difference, but hopefully it allows you to see how the colors were laid down on the image to create the shading. The first colors I used were Cream, Chartreuse and Scarlet Red. The next layer included Sand, Limepeel and Crimson Lake. The last layer of colors included Goldenrod, Dark Green and Crimson Red. By continuing to layer the colors, leaving some lighter spots to "round" out the angel I tried to make her colors coordinate with the beautiful Dill and Crimson papers that I had selected to include in this months kit. As a finishing touch I mounted the angel on the crimson paper and mounted this on the Elegant Holiday paper. To show off the beautiful two-sided feature of these papers I curled the layers back ever so slightly to reveal the crimson underside. 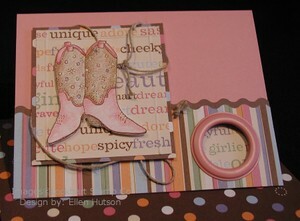 Mounting this on the dill note card and adding that final layer of piercing makes this layout just a little different. To pierce I resorted to my old faithful SU piercing template. That tool has been indispensable when it comes to my cardmaking. Below is a close-up view of the pattern that I used on the crimson paper - adding the antique copper brads gives it the finishing touch. I hope that you enjoy this month's kit and that you get 10 more cards made for your Christmas assortment! Yippie - I've made it downstairs and I'm finally able to concentrate enough to start answering emails and do a little writing. My foot is up and so here goes. Thank you to all for your well wishes and patience with me. Katelyn and Kelcie are here helping in ways that were never part of "the package" - they are working hard to keep up with the orders and messages, as well as helping me with the girls. I'm not certain what I would do without them! Hopefully by the end of the week we will have caught up on all the emails - so if you have sent a message and haven't heard from us please do not hesitate to send another because the first one might have gotten "buried" in our inbox. Thank goodness I had taken pictures of this project previously so that I could write this tutorial. Now I can just sit here and edit pictures, doing the write-up from my comfy place right here on the couch :D With a laptop I can even lie down - foot propped up on the end of the couch and just type away - LOL! Tonight I will take you through how I position the Wizard when I use it, how I cut and emboss the shaped cards and how I create a window in my cards. If you watch the Spellbinders video showing how to use the Wizard, you will see immediately the difference in how I place the Wizard as I work. Envision that I am standing at the bottom edge of the picture above. The handle is to my left with the little button located on the top pushed down. If you need to reverse the direction or run your project back and forth through the Wizard you just push the button from the opposite side and it reverses the direction. This button also makes this tool perfect for left-handed crafters! I recommend that if you currently own a Wizard and you have trouble operating it as shown in the video just keep flipping it around until you find that perfect position just for you. Thus making this die cutting machine Universal in more then one way. Now if I wasn't holding the camera in my right hand you would see that I hold the white mats in my right hand at a slight angle downwards as I insert the plates between the rollers. Using my left hand I run my hand over the rollers moving from left to right - this locks the mats in place. After the mats are locked in place I put slight pressure on the left end of the machine with a couple of fingers - it's kind of difficult to see my fingers on the far left, but they are there. The Wizard is different from other die cut machines on the market. Its handle is utilized in a different way. It does not go round and round in a circle, rather it is a "ratchet" type of device that moves between 9:00 o'clock and the 3:00 o'clock position. In my case I move the handle from the left to the right, bringing the handle back up to the 12:00 o'clock position and repeat until the plates are moved through the machine. Being that the Wizard is all metal it has strength like no other machine on the market. I am told that it literally can have a car driven onto it and it won't crush it.This ratchet type of system allows for great pressure to be exerted on the plates. This pressure can cause the plates to rocket out of the machine when you come to the end if you are not prepared. But you should know that if you have a really tight sandwich in any machine you can rocket your plates out of any machine. I managed to whistle a plate half way across the room with my Big Shot when testing different materials in it as well. What I do to make certain that my plates do not become projectiles is as I roll the plates through the machine I hold the plates as they come to the end and therefore I don't send them across the room - LOL! What I have enjoyed the most is that the impressions produced by the Wizard are incredibly clean and crisp, AND I no longer have to deal with broken and warped plates like I did when using the Cuttlebug and Big Shot. That is not to say that you can't get clean and crisp impressions with other machines - the difference is that you just need to know what sandwich is going to work the best for your particular machine or do a little experimenting. This is the reason for the compatibility sandwiches we have put together. 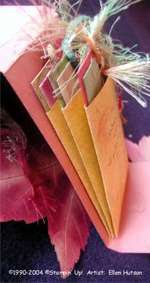 Spellbinders has already done the work figuring out the sandwiches for many machines on the market so that you will not need to figure it out yourself. I would like to remind you to look back at these whenever you have a question about your type of machine. With the Wizard you will need the Master Mats, Spacer Plate, tan mat and die of your choice. For cutting your sandwich always utilizes the Master Mat, Spacer Plate, die (face up), notecard (or whatever else you would like to try cutting) and then topped with the other Master Mat. Please see the Compatibility list for your particular machine. Place your folded notecard on the die as show above, with the scored back lining up along the inside edge of the scallops as shown - be certain to set it to the side of the cutting portion of the die. 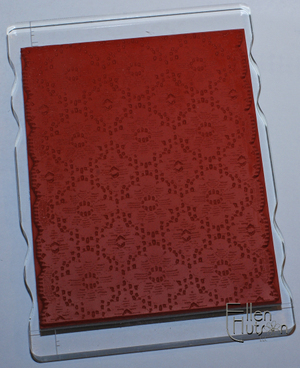 If you do not want to have any embossing on the edge set it completely clear of the scalloped shapes. Run it through your machine. 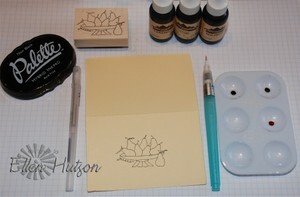 If you would like to add embossing to the card then leave the note card in place. Remove the spacer plate and place the tan mat on top following it with the Master Mat and run it through the machine again. To add a window to my card front I determine where it is that I want the window to be. I then measure to determine where on the spacer plate I am going to adhere the die. Using my ATG adhesive I place a small amount of adhesive on the back side of the die and position it in place on the white spacer plate. This holds the die firmly in place and keeps me from having to make guesses as to where it is. I then use temporary adhesive to hold my notecard in the exact place I would like it to be. Please note how the scoreline of the note card aligns perfectly with the edge of the spacer plate. This ensures that I don't get an extra "line" in my note card after running it through the Wizard. My sandwich with the Wizard is always the same for cutting - Master Mat, White Spacer Plate, Die (face up), paper (or felt, tin, fabric, etc.) and then the other Master Mat. 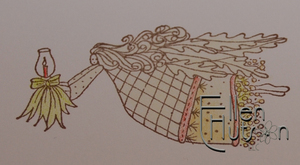 The sandwich for embossing is also always the same - Master Mat, Die, paper, Tan Embossing Mat, Master Mat. 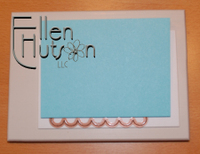 These dies allow you to place your window wherever you would like in your card front. There are no limitations as to where it can be placed. It is one of the biggest features that makes me gleeful - LOL! 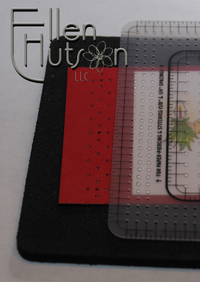 Cut your shape out of a scrap of cardstock being certain to allow enough extra space for a larger die cut to follow. Position the cut out over the top of your next die shape, centering it over the die so that you can not see it. 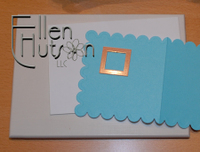 Cut - you could also add embossing at this time, but I chose to make this frame without embossing. WOW - that took a long time - it is now the next night! I'm still in the exact same spot as I was yesterday though - LOL! Hopefully this makes enough sense to help those who would like to make shaped cards, windows and frames, as well as answer the question regarding how I use the Wizard. Be certain to double-click on this image to open it larger on your screen as you read the information below. In my opinion, no one colors like Karen Lockhart! I have had the pleasure of coloring with her and learning from her. I asked Karen if she would be willing to share with me one of her coloring progressions so that I in turn could share it with you. Above is the example she created. Before beginning to color I always suggest to my students that they color on a scrap paper first - one that has the same "tooth" as the project that they will be working on. A wonderful test is to see how "light" it is that you can color. Using a light hand is the key to success in coloring when not using Gamsol or some other blending solution. Get your depth of color by laying down many layers of color; allow the paper tooth to still be visible. 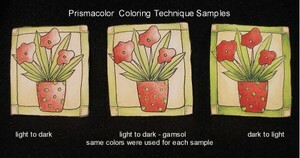 This technique allows you to create so many more colors then you could ever receive from one dark layer, or one color blended with Gamsol. If you think about your coloring project as if it is a decorating project you will be able to control what it is that you are doing to a higher degree. Putting an accessory in a room that is not even painted is not typically the best method of creating a successfully balanced and designed room. An analogy that Karen has come up with that I absolutely LOVE is to think of creating your little piece of art with these three words in mind: Prime, Paint, and Decorate. In the first stage of priming your project you wouldn't zero in on one little corner and complete it - you would cover all the walls with your primer coat. The first layer of this image was created by applying Sand, Deco Pink, and Lavender on the flowers; Chartreuse on the foliage; Blue Slate on the vase and Sand and Pale Sage on the "window". This helps you define your project - it is the stage where you determine where your colors will be placed. If you look very closely you will see that neither Karen or I "stay in the lines" - color when allowed to "fuzz" outside the lines helps blend the image and bring color in to those "empty" areas. In the next stage of "painting" your project you will add Ochre, Hot Pink, and Parma Violet to the flowers to further define them. Kelly Green will be added to the foliage and another layer of Blue Slate and some China Blue will be added to your focal image. You can also further define your "window" at this point. Think of the "frame" as a sunny window - darken the edges leaving more of the white tooth of the paper showing directly behind the image - as though the sun were shining in from the back. Last, we are going to "decorate" our image by further enhancing it to add more detail and interest to it. Dark Brown is added to the flower centers, Process Red and another layer of Parma Violet to the flowers. Dark Green is used as the last layer on the foliage and Copenhage the last blue on the vase. Add a little Gingerroot and a little more Pale Sage to the window. You will notice that by repeating the same color numerous times your intensity will increase. Don't overwork your project - stop before you go to far! You can always come back to it after letting it sit for a while and determine whether it truly needs more color. Coloring is such a relaxing thing for me to do - I absolutely love to just sit and color in images. I hope to share a different color version of this same stamp using the same technique, but I doubt it will happen this week. I still have house guests (my family is still visiting), my girls are in the final throws of preparing for their big dance recital - rehearsal, pictures, etc. You name it, we have it happening again here at our house this week - LOL! So please forgive my inability to get everything done that I would like to. I would also like to add that many of you have requested the paper Karen and I use when we color and I am thrilled to tell you that I have gone ahead and placed this item in the store. Nothing seems to compare to this paper, Neenah Classic Crest (Solar White, Classic Natural White, and Classic Cream), when it comes to coloring using Prismacolor color pencils and even Copic markers. I thank you again for your continued support and enthusiam!!! I sincerely hope that this little "tutorial" of sorts helps you gain some insight into coloring this awesome Lockhart image! ETA: I'm bumping this message to the top so that you all will remember to enter your comments before midnight on April 12th to enter in our "Friday the 13th is Your Lucky Day!" drawing. Please be certain to leave your comment on this thread! Good luck to EVERYONE! "Never miss a chance to celebrate!" Life brings all kinds of things and when the opportunity to celebrate presents itself we should truly take advantage of those occasions and have a wonderful time! SO with that the countdown continues! Be certain to read to the very end of this post to find out why Friday the 13th might just be YOUR LUCKY DAY!!! I would like to start this post off with a huge THANK YOU to those who support my little business. You have no idea how much your support means to me and my family. I thank you from the bottom of my heart! Many of you have requested information as to how it is that I do my thank you notes that are included in with the orders you receive. I started by hand coloring each note with color pencils, but then realized I needed to step-it-up a notch when it comes to speed. So following are my little secrets :D I guess they won't be secrets much longer - LOL! Products used: Palette Noir Ink (sometimes I use Burnt Umber - depending on whether or not I think that brown would be better then black), Stamp, Adirondack Reinkers, Lyra or Stampin' Up! 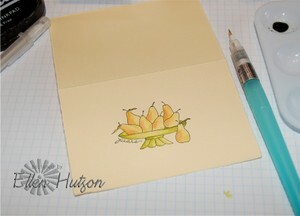 Watercolor Crayon, Stardust Glitter Pen, Arturo Note Card (Buttercream shown), Watercolor Brush with fine tip, tray. (items noted in blue are in stock, but not yet added to my webstore - sorry - I wish I had more time in the day and night :D. If perchance you do not want to wait any longer for these items just pop me an email when you place an order and I will add them in to your current order). For this project I decided to use a colored Arturo note card so that you could see what it looks like to lay color on top of an already colored card. As you will see - it can create an AWESOME look! Begin by dropping one little drop of each color in to your palette. I kid you not when I tell you that one drop can last for between 50-100 thank you notes! Depending on area colored in and intensity of color. I do not clean this palette between sittings. You can easily rehydrate the color with a droplet of water from your waterbrush if it happens to dissipate on you. 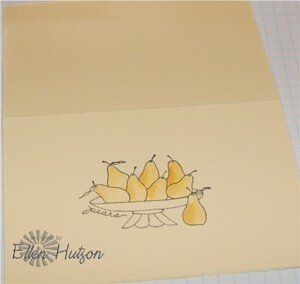 Lay down a wash of the color Carmel to all of your pears - it will appear uniform as shown in the pear on the left. Make certain that the depth of the color on your waterbrush is not too intense. This is the reason for all the little scribbles all over my scrap paper - LOL. I typically will "test" the brush before placing it on my image to see what the intensity of the color is. If the color is too intense I will add a droplet of water to the little "bowl" to lighten the color. I work quickly, so that when I lay down the second layer of color the first is still quite wet. This allows the more intense color to bleed into the first layer. You will see a little more pooling in these pictures then is typical just because I was snapping pictures and therefore not working quite as quickly. So if you like this look just allow your image to dry slightly. I also added a tiny hint of watered down Red Pepper to this image. Next I colored the bowl celery, and added a hint of celery to the right side of a few pears. As you can see from this picture I usually have my dark side on the left (and no I'm not referring to my Star Wars dark side - ha, ha). It is just easier for me to color my "dark side" on the left at all times. With the bowl you will see the color darken some on the right as well, just to try and create a somewhat rounded shape to the bowl. I have no technical watercolor training, in fact a lot of what I do is by the seat of my pants - LOL! I keep falling back on to my interior design training and thinking in terms of overall balance, focal point, interest, etc. You will see a watercolor crayon now laying in the picture. I take the tip of my watercolor brush and just touch it to the crayon to add highlights to my green. Being that I typically only use three reinker colors I sometimes add in watercolor crayons for that little added umph. Last but by no means least I use the glitter pen to add little hints of color to the image - just to make it shimmer. I use a VERY light hand to add this detail so that I don't end up with a streak down my work. It is odd how when I captured these pictures my lighting and the camera lens REALLY picked it up. It is not nearly as noticeable IRL - go figure. SO - if you read all the way here to the bottom I'd like to share how you can participate in the little celebration that I will be holding on Friday, April 13th. 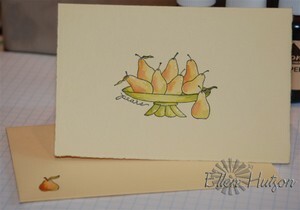 There will be a drawing for a pair of pears, and a few other fun items that I carry in my store. I'll tell you a little more about this itty bitty surprise tomorrow. Many of you are so observant that I think you will spot one of the little surprises that will be unveiled over the next few days, but I guess we'll see now won't we? I know I'm such a tease - just ask my kids - LOL! and if you usually stamp with a group or by yourself. That's it - do it all before midnight on April 12th and on April 13th a random number will be drawn and the announcement made. So start your engines ladies and post away. I hope to share more goodies and snippets in each of the upcoming days, so stop in whenever you get a minute. Finally as promised - doodling 101. The basics of doodling are one of the topics I will be covering in the class I prepared this sample for. Following is just one of the tips that will be covered in the class I am offering at Make an Impression here in Issaquah this March. I know, I know - I need to update my class schedule!!! Yikes - life just has too much happening right now. 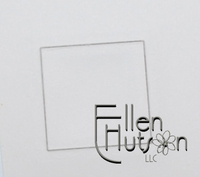 First get out that old handy dandy light box - you know the one you no longer need for dry embossing since the arrival of the many wonderful "crank machines" such as the Cuttlebug, Wizard, Big Shot :D Or if you don't have a light box just grab some tracing paper and start that way. Trace the design that appeals to you.Try to work in long smooth strokes not lifting your pen from the paper. Don't trace everything - just pick and choose what appeals to you. Copy and reduce the size. In this instance I reduced the image by 50% and then 50%, 65% and 78%. This gives me several different sizes to choose from when working with my stamped image. Determine which size suites your project. In this case I felt the bird would work better facing the opposite direction, so I flipped it and traced it again using my light box. only trace the portion of the design that fits. Then shift the design, modifying your original image slightly by doing so, and finish tracing. This is where I begin looking at the rest of what is inspiring me. I picked a design out of the flowers on a coordinating paper and just started drawing one of the details on the remaining elements freehand using a pencil. Draw this portion VERY lightly. After your design is completed trace the refined design with your Zig pen. Allow the ink to dry and then use kneaded rubber to erase your pencil guidelines. Many times I add in more pencil lines than what I use in the end, but it gives me a guide to avoid mistakes. Once my design is complete then I select my color pencils. As you can see I choose anywhere from 2 to 4 pencils from each color family. I scribble them on my scrap paper and then lay it all out with the color scheme I will be working with to determine whether I have selected the appropriate colors. I begin coloring by placing my darkest or strongest color first - balancing it around my little piece of artwork. I color until I have the balance in my piece and it blends in with the colors I have selected. SO here is my completed project that is the example for Make an Impression, the store I am teaching this class at in March. I would love to have you come and leave a comment linking me to your practice pieces - it is so fun for me to see what you are all making with your stamps!!! Last night I was stamping "virtually" with some of my friends. One of the challenges was to use the color scheme red and caribbean. My mind immediately went to the Lockhart Teapot and exploded. So I thought I would share one of my more "over-the-top" doodling sessions with you all, being that doodling is sort of a topic I enjoy. I'm not certain if any of you have heard of Rosanna, but the tea, table and dinnerware she creates is absolutely stunning!!! (I wish I had loads of room and $$ so that I could collect the entire line). Her red dot series, along with a piece of Wild Asparagus "birthday" paisley/yellow paper were the beginning inspirations for this card. Now being that I am such a "gifted artist" (insert huge explosion of laughter here!!! 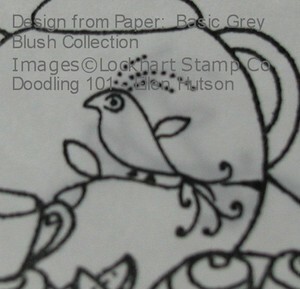 - you girls just crack me up with your comments - I love you all so dearly and you certainly know how to make my day :D) I just went for it and doodled the design on the teapot with a very fine tipped pencil. I then follow this up with my Zig .05 Millenium pen - this is the perfect size to go along with the images that Karen Lockhart creates. I will be putting these in my store as soon as I have the time to photograph, enter, etc. because I WANT you all to start trying your hand at this fun little artistic endeavour! Upon completion I then take kneaded rubber and erase the pencil lines. Now, for those of you who believe that you can't draw a straight or curvy line to save your life I am going to share a wonderful way to begin this adventure. Look for it in tomorrow's posting!!! 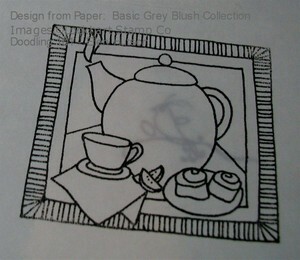 Unfortunately I took a side adventure on this image and you will note that the white on the teapot is not truly white. I was able to get it close to white again by once again using my kneaded rubber to get rid of the red I happened to smear all over the image. My misadventure began when I decided to try this fabulous new product on the surface to make it shiny like porcelain - NOT! What was I thinking?!? Prismacolor color pencils have a wax base and goofy me tried a "waxy" product called MicroGlaze on the surface. BIG OOPS! I will talk more about this product in the near future because it IS totally awesome, but it is NOT totally awesome when it comes to color pencils - LOL! 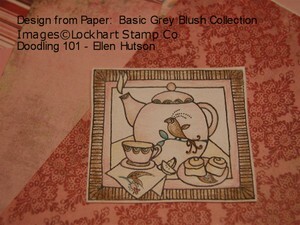 One of Karen's amazing talents is the ability to make one stamp look SO many different ways. 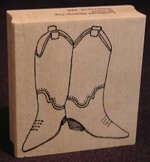 Below is a series of the boots that Karen Lockhart colored and presents to each and every store that purchases this stamp. I LOVE the swirl design on the left. 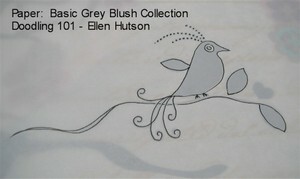 This is created by using the Soft Grip fine tip embossing stylus on the paper to doodle your design. Then as you color over the top with Prismacolor color pencils, the detail of the design pops right off the paper like magic! She then followed it up with the wonderful Sakura Stardust pen to add a little glitz - what a perfect patriotic celebration boot this is! The sentiment beneath these boots just had me giggling! Oh the meanings you could think of with this one - Karen just cracks me up! (in a good way Ü) I can hardly wait for the rest of this line to hit the machines!!! There is more to come and it is a killer waiting for them - so Karen if you are reading this PLEASE HURRY! LOL! So you might think - I CAN'T DOODLE! That is where I would like to make some suggestions, because I believe we ALL can doodle!!! Below is a simple way to start. 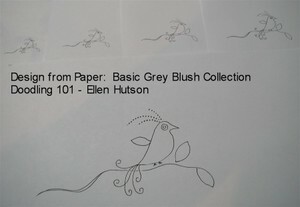 Find a piece of patterned paper that has a simple design and use it as your guide. 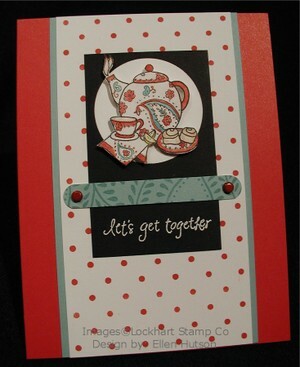 The polka dot paper from Making Memories was the basis for this whole card design. It comes in a pad and has coordinating sheets that really make it simple to use. 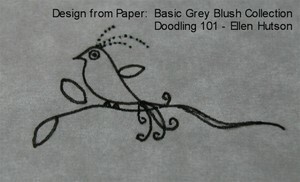 I selected this pattern to start with to share how easy it is to make a doodled design. 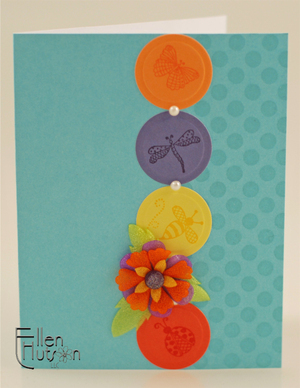 Another tip from this card is the lovely little grommet on the lower right. As you all well know I am totally a gadget girl!!! If there is a new tool I MUST try it - bad, bad, bad! Well maybe not so bad Ü This little pink ring is from Making Memories latest tool kit - the Grommet Kit. The first point I would like to make is that I LOVE the end result, BUT getting there was quite the task! I think I might contact Making Memories and ask about the whole layers thing and if I have a faulty punch. Being that it is easier to have everything line up when it is all affixed I put my three layers of paper together before "punching" out my circle with the "circle cutter" included in the kit. I kid you not when I tell you that I pounded on this baby no less than FIVE minutes to get these holes punched!!! FRUSTRATING, but in the end totally worth it being that I LOVE the look. So watch for more doodling lessons and ideas to come! Have a wonderful and creative weekend!!! Do you remember one of my first posts here on my blog? 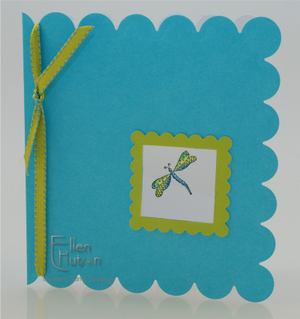 Yes, it was a fav tool of mine that I have repeatedly said you can not live without Ü I received a little snippet from one of my distributors on Friday and I want to connect you with the fabulous tutorial, "Card Keeper", that Club Scrap has put together for Craft TV Weekly. They also have an itty, bitty project on Craft Weekly that is so reminiscent of this project I did as a guest artist for Splitcoaststampers Dirty Dozen two long years ago - LOL! Being that this information is well past the date that I have promised not to share this picture outside of SCS I am going to post here for all to see. It will also give those of you who are not members of the special SCS Fan Club a little taste of some of the fun things that get posted to their website each month. It is so worth being a supporting member of SCS! I certainly wished I had a better method of scoring back in those days. Now, I don't have to wish any longer because I have my Scor-it and I'm creating some things that I can hardly wait for the day to be able to share them with you. All this working for a living stuff, kind of keeps me at bay sometimes with what I am able to share. So I will try and just create more that will just be eye-candy right here! ETA: I just realized that I should probably give a little information regarding this project - otherwise you might all be emailing me - LOL! The tags were created using little rectangular pieces of balsa wood that I had purchased from Packaging Specialties. I think I have seen them at Impress as well - but, being older and all I'm forgetting these details - LOL! I dyed these little wood pieces using reinker and used my leaf punch (which I do believe has since been discontinued) from SU! The quotes were all found at my favorite quote site - The Quote Garden. To get the quote on the front of the coin envelope I printed on plain paper, then used temporary adhesive to attach the envelope to that spot and ran it through the printer again. 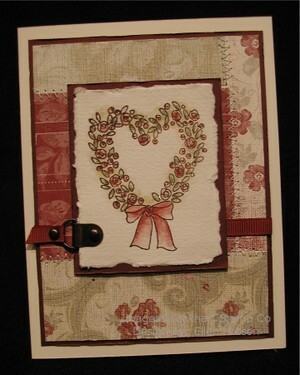 I used one of my all time favorite stamp sets at that time, "All Natural", to embellish the pockets and cover. Mica chips were then added using Diamond Glaze to give it that natural, funky feeling. I must admit I'm laughing at the fibers now Ü I would probably go with a linen thread or something more "natural" or simple now. It is fun to see styles evolve, especially one's own - LOL! You can also view more projects now that Scor-it has developed the project of the month. If you are still doubting whether you need one of these gadgets - doubt no longer!!! Good things are yet to come with how you can use this tool, but the basics are the basics! AND the basics are crisp, clean, beautiful folds in your projects!!! WOW - it's been a busy and wonderful weekend around our house. Our Christmas tree is in the house, my DH has the outside lights all up and much of the Christmas shopping has been completed. Very little creating has taken place other than a couple of things for upcoming publication calls. Many of you have been asking me about the texture plates and I hope that it is alright with you that I post the answer here to save some time. I truly appreciate your enthusiasm and hope to keep creating new, fun things with my CB. Hopefully this will help get you started on your road to success. I have also heard of machines popping apart with the use of Sizzix dies. I guess I'm feeling extremely lucky right now being my little machine is still holding tough, even after the stuff I've run through it. I am LOVING this little gadget!!! I do believe that the Wizard Charm Embossing kit is essential to running these other items through the CB and getting a good impression. I'm going to try and order some of these and put them into my store so that anyone trying to find them can continue to create to the fullest extent that this little bug will allow. 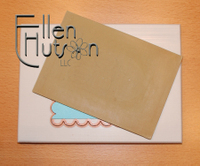 ETA: Spellbinders has created a new packet of Tan Embossing Mats - these are perfect for using in the Cuttlebug and other manufacturer's machines to emboss with the Nestabilties, Fiskars Texture plates, brass stencils etc. Please see the compatibility charts for information regarding your machine. Well the lazy girl in me was totally pushed aside during our retreat in "Minnesconsin" Ü The girls (Lisa and Robin) had this AWESOME little machine (well darn the link didn't work - just go to Home Depot and in the search mechanism type in the word Janome - it's the $54.99 model I'm eyeing) and they let me "test drive" it. I learned how to sew at a young age and have sewn on cards before, but my "real" machine has been quirky - the tension just doesn't want to leave that poor cardstock alone. Then I purchased a cheapo ProvoCraft machine - let me tell you - do NOT waste your money. 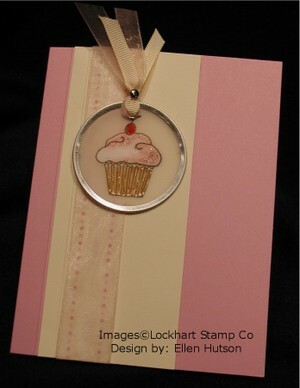 Look at what I was able to do with some of the fabulous Recollections Stampin' Up! paper and this simple little machine :D I'm so excited - I might just get one and sew on my cards more 'cause I LOVE the look!!! 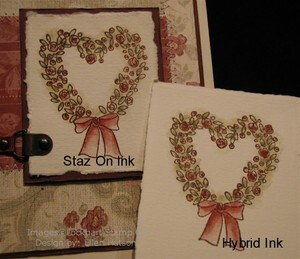 As soon as I saw this I knew I had to use the Lockhart stamp "Heart Wreath" - it is perfect with this paper! OK - so here is a picture up close of what my "test drive" included. I used every stitch on that machine on this little piece of paper. The key is to adhere your "patch" pieces to a solid piece of cardstock first and then just sew away! Thank you Piney, LZ and Robin for the opportunity to allow me to play! Make certain to pull your threads to the back side - I then just taped them off with cheapo scotch tape (quick and easy) and voila - a LOVELY pieced together background. I do believe I'm loving this shabby look. Here is "test drive" number two for this blog entry. Well you all know my fascination with tools and inks - well the one and only Julie HRR got me going and as you noticed she posted her box to her blog yesterday - filled with those beautiful little ink pads. Well I've been testing - a girl's got to know if she's going to teach others :D But first I "need" to show you these cute little numbers all ready to roll in my NEW CRAFT LOCKERS!!! (I'm REALLY trying to get organized so that I don't waste time looking for things. Hopefully I'll be able to post the new pictures of my "disaster" area shelving soon - currently much of the product is still ALL over the floor!!!) Look at these tempting beauties. 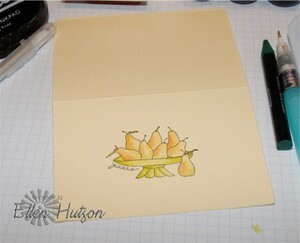 Test one - Fabriano notecards and watercolor (note card above Ü) Not much of a difference - I think the difference is more due to the amount of pressure I put on the stamp than the ink. End result after watercoloring - PERFECTION - woohoo that means 36 colors to use that I can watercolor with!!! Hopefully I'll be back tomorrow to share my next Palette Ink adventure with you all. I do believe I have found a fabulous new ink to play with thanks to the discussion over on SCS earlier this month! 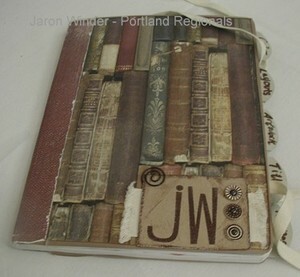 This is to help any of the ladies looking for Jaron Winder's Inspirational Journal idea. I have wanted to make one of these ever since I saw his, but just haven't gotten around to it. Unfortunately I didn't open it to take pictures of the inside, but hopefully you can get some inspiration from these pics. Titles read: Color, Layouts, Artwork, Titles and I don't remember the last one that the twill is covering (insert sad eyes). In the color section he would pull picks from Crate & Barrel, Pottery Barn, clothing ads, etc. He would paste them into his journal and then collect and paste 3-4 punched out circles of color that would coordinate with the ads for color inspiration. It was quick and easy with no mess. Jaron pulls all kinds of things from Magazines, every type of magazine. The Jen/Ben portion of his presentation had us ROTFLOBO! But look what he did with that idea! Then the colorblocking! He really was inspiring!! Tying Ribbon when you're all THUMBS! 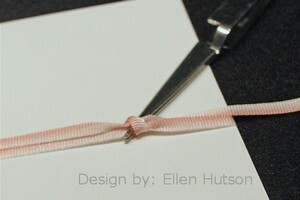 I always tie a square knot for my cards - left over right, then right over left. 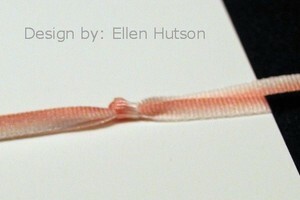 Hold the first loop of ribbon together using self-closing tweezers. Tie the second set of loops and tighten. Perfection each and every time Ü WOOHOO! I have always been fascinated by Pergamano. Several years ago I was at a Rubber Stamping convention here in Puyallup and there was a lady there who had absolutely STUNNING pieces of "art" in her booth. 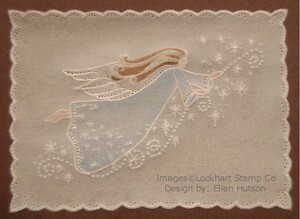 With these gorgeous little angelic creatures Karen has designed I wanted to find a way to make them almost ethereal. I've been playing alot with "clear" materials lately in my never ending quest to "master" the products and techniques that are out there. In my quest I came across Michelle Laycock's tutorial and another fantastic website - Creative Papercrafts. I will be the first to admit I have a LONG way to go in mastering this technique and I'm certain that a few tools designed specifically for this technique would certainly help, but I thought this came out rather pretty. It was extremely difficult to photograph and I just couldn't catch the little bit of "shimmer" I added to the wings and stars with the Sakura Stardust Pen. I will continue to work at this technique until I have it down cold, so to speak, so here is my first attempt so that you can track my progress as I continue to work to master this ethereal look. Have you ever thought you had a lightbulb moment and tried it out only to start laughing at yourself and your NOT so amazing "brainwave"?!? Well tonight I was looking at the challenges posted on SCS and decided I needed to just play for a while before going to bed. I have been working so hard to meet deadlines over the past few days that I haven't had a chance just to goof off. So I looked at the sketch challenge (using a circle in my layout) and the color challenge (sage, artichoke and caramel) and then I looked at the technique challenge. 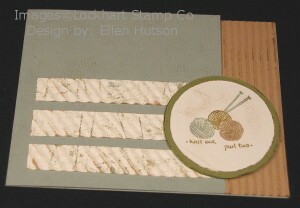 I had already decided I wanted to use the Lockhart stamp image "Knit One Purl Two" because of the whole "circle" theme. Color that was cool - I could do that, but then the technique challenge (using a balloon filled with textured objects) just wasn't working for me mentally with this whole yarn thing buzzing through my head. I began thinking - well I'll make my own yarn background and this is where it all gets pretty funny!!! Well I guess it is kinda looking like yarn and it is a little fuzzy. Perhaps if I unwrap the yarn after heating the penscore and embedding the details it will work better I mused. Oh goodness - what WAS I thinking??? When you remove the yarn the impression is embedded - in fact it is embedded so deeply I just lost that lovely fuzzy feeling I was going for - LOL. So this was my attempt at creating something new and different. Perhaps I managed "different" but I'm not certain anyone will be trying this "novel" new approach to creating a yarn textured background. Hopefully this will provide someone with a few good laughs today!!! It is always fun to make new discoveries! I had been told that I would be able to print on this May Arts twill using the latest Xyron gadget, but being I don't have one and I really didn't want to purchase one at this time I thought I would try sending it through my printer. Needless to say I am thrilled with the results!!! 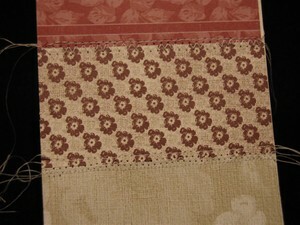 I can now print whatever I would like, in any color I would like on this beautiful twill. 1. I do believe that the type of twill you select is KEY to your success. 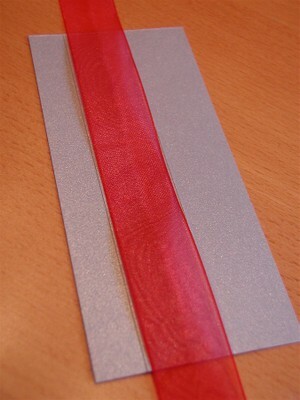 This particular twill is made by May Arts - it is 100% polyster and VERY thin. I will take a picture of the colors I currently have tomorrow - white, off white, pink, moss and caramel. 3. Print text on paper. Cut twill tape approximately 7 1/2" in length. It can definitely be shorter and it can be a little longer, but you want to be certain that it does NOT drape over the edge of the sheet of text weight paper. Affix two rows of 1/4" ATG Tape on the very edges of the twill tape as shown. 4. This is the tricky part - trying to get your twill over your message. As an afterthought I have come up with what I do believe would be a great way to avoid placing the tape in the wrong spot or crocked. In the future I will draw a pencil line along the top and bottom edges of my message all the way to the edge of the paper. This will allow me to line up the twill tape without guessing and will also help me to keep it straight. 5. Place paper back in printer tray and print - it's that easy! Immediately upon removal heat set the ink - otherwise it may spread slightly. Peel twill from text paper and affix to card front. Color pencil is very hard to remove once it is on paper. It is easier to remove light colors than dark colors. 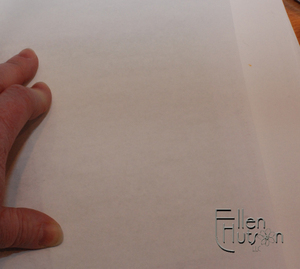 Here are a few tips in removing color from the surface of the paper. • Remove color pencil with a Design kneaded, electric or Mars plastic erasers. • Remove color pencil with artist's tape. Gently press down the tape into the area you wish to remove color. 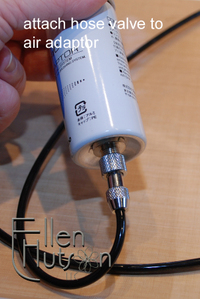 Use your finger in a circular motion and rub the area, then gently remove the tape. Be careful when lifting so as you don't tear the paper. 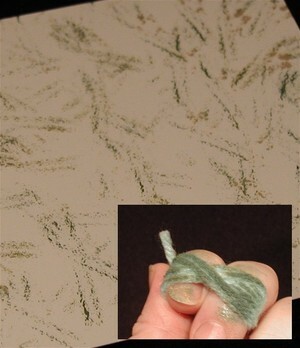 • As a last resort use an X-acto blade to lightly “pick” the color off the paper. 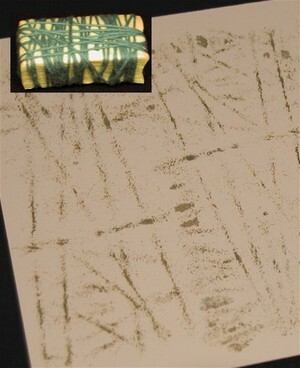 You will not be able to color over this technique without it being noticeable because you have changed the papers surface texture. Classic Crest 80# Cover Cardstock in colors Solar White, Natural White and Cream work beautifully with stamped images and color pencils. (I purchase mine in bulk from Paper Zone; I usually wait until they have a sale Ü) However, my advice is to just explore and experiment until you find that perfect paper to meet your needs and requirements. • Keep your pencil points sharp - sharp tips work best! • Make sure to keep the surface of your paper clean, by using a drafting or make-up brush to sweep away debris and dust. • Be careful when applying heavy pressure, such as when you burnish, sometimes pencils tend to flake. To remove the flakes use a brush. • Using several layers of different colors together to add some “spark and life” to your images - don’t use just one color. • Keep pencil strokes even, and consistent in pressure. • Start off with light pressure when adding layers of color and gradually increase your pressure. • To create vivid intense colors, try using a solvent (Gamsol, turpenoid, Berol Prisma colorless blender, mineral spirits, baby wipes) applying it with a blending stump. • Beware of over saturating your paper's surface with too much color, the color will start to no longer adhere to the paper's surface. You may also start to wear and possibly tear the surface of the paper. • To remove wax bloom (a build-up of wax on the surface of the paper), wipe the surface of the paper with a soft tissue and then lightly spray your work with 2 to 4 layers of Krylon workable fixatif. The fixatif will prevent wax bloom. • Make sure to add a good range of values throughout your artwork. • To add life to your work, try varying the color intensity in your artwork. • Make sure the color temperature (warm and cool areas) in your drawings are well balanced. 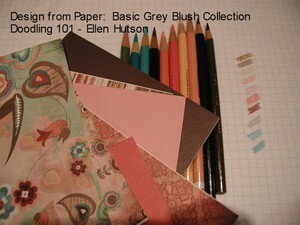 • Try creating different moods, by stamping and coloring on different colored papers. • When working on a tonal piece, work from dark to light. adjacent hue - a hue that is next to another hue on a color wheel. blending - a technique of applying one layer of color over another layer of color. The combining of the two or more colors together creates a new color. A tortillon (or blending stump), solvents, erasers, or blending pencils can be used to blend and smooth out the colored pencil layers which make the colors very bright and vivid. 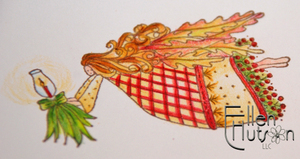 burnishing - using a light colored pencil or metal object with heavy pressure and applying it over layered colors. It makes the colors look brighter, sometimes lighter and can give an image a polished or reflective look. chroma – the characteristic of a color that refers to its saturation or intensity. 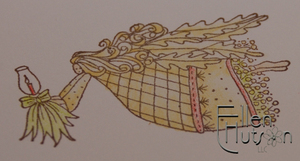 color pencil - a pencil containing a wax, oil or water-based bound pigment as its "lead". They are semi-opaque accept for white, cream and grey. A popular name brand is Prismacolor Pencils. color temperature - warm and cool hues. complementary colors - hues that are opposite of each other on a color wheel; when mixed together complementary colors yield a brown or gray color. crosshatching - a technique used in coloring, where patterns of lines in different directions may be layered to create tones and new colors. Colors can be mixed by crosshatching. fixative - a protective spray you can apply to color pencil work. 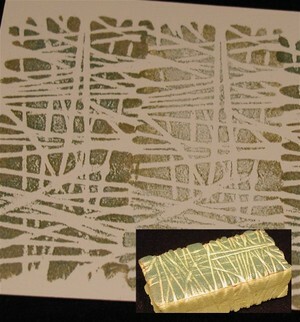 It also helps prevent wax bloom and can be used when color won't adhere to the surface of the paper. hue - the specific color classification given to an object based on the seven colors found in the color spectrum; red, orange yellow, green, blue, indigo, or violet. impressed line - a technique in which one can impress lines onto the paper using a tool to achieve white lines or light colored lines. intensity - a color's strength – brightness or dullness. layering - applying one pencil color stroke after another, building numerous layers of colors. pigment - the substance that absorbs light, producing (reflecting) the same color as the pigment; the pencil color to be applied, either wax or oiled based. pressure - term used when applying color either lightly or heavily to the surface of the paper. saturation - the purity or intensity of a specific hue. solvents - a class of chemicals that are used to dissolve other substances – i.e. 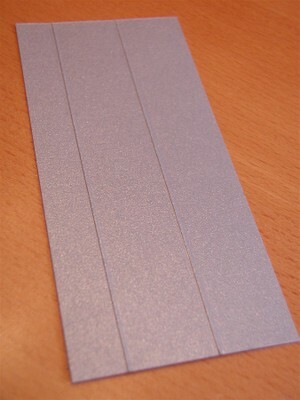 the color pigment on the surface of the paper. strokes - the direction in which color pencil is applied. value - the shade (darkness) or tint (lightness) of a color. Also called brightness, lightness, shade and tone. wax bloom - is a build up of wax from wax based pencils, which creates a whitish haze on the surface of the paper. It forms especially when heavily worked, as a layer of the wax medium rises to the surface. It tends to appear once the work has been sitting for a week or two. To prevent wax bloom, give the drawing a couple of layers of fixative. After teaching my coloring class in Spokane, and then again in Calgary, I decided to compile some of the information that may benefit my students and any other color pencil beginners. In my quest to attain knowledge I am ALWAYS experimenting! The following picture shows a series of coloring techniques I experimented with last night. The first is the one that I have been using the most. You begin with your lightest color and lay down a layer. In the next layer of color you lay it down in a crosshatch method and cover only a portion of your image, allowing lights spots to “shine” through. Keep adding layers in portions of your image until the desired effect is achieved. This technique allows me to use my micro-tip embossing stylus to add details to my stamped images. I LOVE this technique for it’s depth of color – the “tooth” of the paper shows up beautifully with this technique and you know you’ve done it “right” when you have a smooth transition from color to color and yet still see the “white” showing through. I wish you could really “see” this example first hand – it is so hard to capture on film – if only I had a better camera… When you look closely at this project you can see each individual color, as well as the colors that are formed through the layering/blending of these colors. You can’t see it but the red actually covers the entire flower blossom – it appears that a portion is white, but that is due to my lack of photography equipment (insert sad eyes). The second is the one that I see most people using. This technique is similar to the first, BUT in this technique I used Gamsol (an odorless mineral spirits) and blender stumps to “blend” the colors. In this technique the solvent intensifies the colors and blends them seamlessly. It varies from the first in that you do NOT see the individual colors after blending when you look closely at the image AND the colors are more intense. The last technique is one I have seen done by Terry Medaris – he is the master of this technique. This technique begins entirely opposite to the first two. When using this technique I start with the darkest color first. I lay it down softly over only the portion of the project that I want to be super dark. The next layer added is the medium tone and last comes the lightest color. If I want “bright” spots in the image (for example you will notice in the flower faces that there is almost a “golden” cast to a portion of the design) I lay down a layer of a very light color – in this case cream. Once I have the sequence of colors put down I then keep adding layers until the desired color is achieved. I hope you find as fascinating as I have. Experimentation and practice are keys to success! I will continue to practice and experiment until I feel that I achieve the true look of an artist!!! Hopefully this photo will do a better job explainin' - having a fever does wonders for my thought process - LOL! They say a picture speaks a thousand words - right?!? It looks so "finished" when you actually adhere the ribbon, but being that I wanted to just show the thought here I didn't adhere my red ribbon! Hope this helps all those who I had baffled with my earlier post. 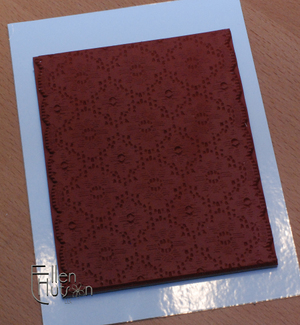 This tool can also create a wonderful pattern on your cardstock. 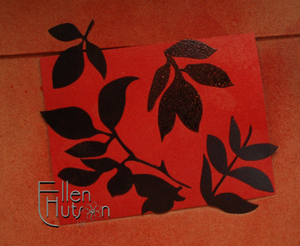 I love creating texture on cardstock and this tool helps you do it in a very "professional" manner. I am absolutely LOVING my new Scor-It - you might ask me if it is worth the $60 it costs retail and my answer would be a resounding YES!!! I am finding all sorts of ways to add professional looking "details" to my cards. 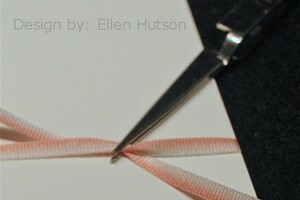 "Channeling" my ribbon and accent papers is one of my fave things to do with this little gadget. It takes a little practice, but after only a couple of miscue's I've got it figured out. Hopefully I can continue to share new ideas using this device in week's to come - TIME - I wish I had more of it!! !